The Mises Institute deserves great credit, too, not only for its support of your work on this project, but also for producing a book that is a fine example of the publisher's art: the typeface is clean and clear, and large enough to permit effortless reading; the layout is spacious and proper; the footnotes are where they should be, and they, too, are large enough to be read without a magnifying glass; the illustrations are splendid complements to the text; and the indexes are terrific. The work is thus not simply beautiful intellectually, but beautiful physically, as well.If I had ever written anything half so wonderful--and I recognize that I lack the abilities to do so--I would consider my career a complete success, and feel myself justified in taking my ease, to rest on my laurels. I do not perceive that you have this plan in mind for yourself, and therefore the world will be the better, not only for your great book on Mises, but also for all the great achievements that lie in your future. I salute you, my friend, not without a touch of envy, but with my whole heart." I'm loving this book. I'm on p. 740 (of 1050 total -nonreference pages) now and it's fantastic. Have been waiting for a book like this for over 30 years. 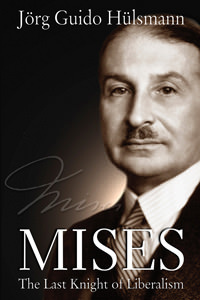 Fills in soooo many details about Mises and his ideas, his critics, his family, his milieu, etc. Incredible scholarship. HIghly readable. I thought I was a big Mises fan - well Hülsmann is the biggest I have ever seen. But as far as I can tell, he's pretty even-handed when it comes to showing Mises' questionable actions too. That says a lot. The binding of the book is excellent and it even has this wonderful bookmarker built in. Only problem is that at 1142 total pages, of quality paper, the book is REALLY heavy, and makes my hands numb, just holding it for over an hour. Buy this book!!! I recently finished "Human Action" by Mises and was amazed by his clarity of thought and rigour. "The last Knight of Liberalism" had just been published and to get an opportunity to read about this extraordinary intellectual was, well, exciting. I've started reading the book and can't keep it down! I highly recommend !!! Christian Ethics versus the Market?